Spread the word to your colleagues! We are now accepting applications for next year’s Art & Language Arts program. 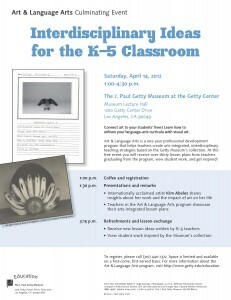 Download an application for the 201212 class on the Getty Museum’s Web site. Applications are due May 1, 2012. Gain new ideas for integrating art and language arts by attending the Culminating Event of the 20112012 class of the Art & Language Arts program. Not only will you take home over 30 new lesson ideas, but you will also hear from internationally acclaimed artist Kim Abeles, who will share insights about her work and the impact of art on her life. Register now for the Art & Language Arts Culminating Event and discover new interdisciplinary ideas for the classroom. Call (310) 440-7322 to register.